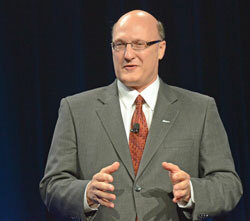 National Biodiesel Chairman, Gary Haer, took to the stage today to address attendees during a general session. He commented on the Presidential campaign in his state of Iowa and how nice it would be if they could get out and visit biodiesel plants on their campaign stops. A key focus of his remarks was how the growth of the RFS would create new jobs in America. On our national biodiesel campaign tour, I’d introduce Americans to green-collar workers who are our boots on the ground. The people who put on work shirts, coveralls, and hardhats day-in and day-out to produce energy security one gallon at a time. And while the Presidential campaigns continue to move across the country, the recent State of the Union address spurred a renewed dialogue about American energy policy and green jobs. I am here to tell you today: Biodiesel must continue to advance policies that position our industry as a fundamental part of the U.S. energy complex. If we can work together to grow the Renewable Fuels Standard, the biodiesel industry could create 26 new jobs every day over two years. 26 new pairs of work boots to be filled every day. 26 work shirts which will be put on every morning by hard working Americans. RFS2 can create 26 new green collar jobs every day, some of which will be in the oil and agriculture industries. That’s 26 new skilled, family-wage positions every day. 26 more domestic jobs producing our nation’s energy security in just two years with the growth of the RFS2.